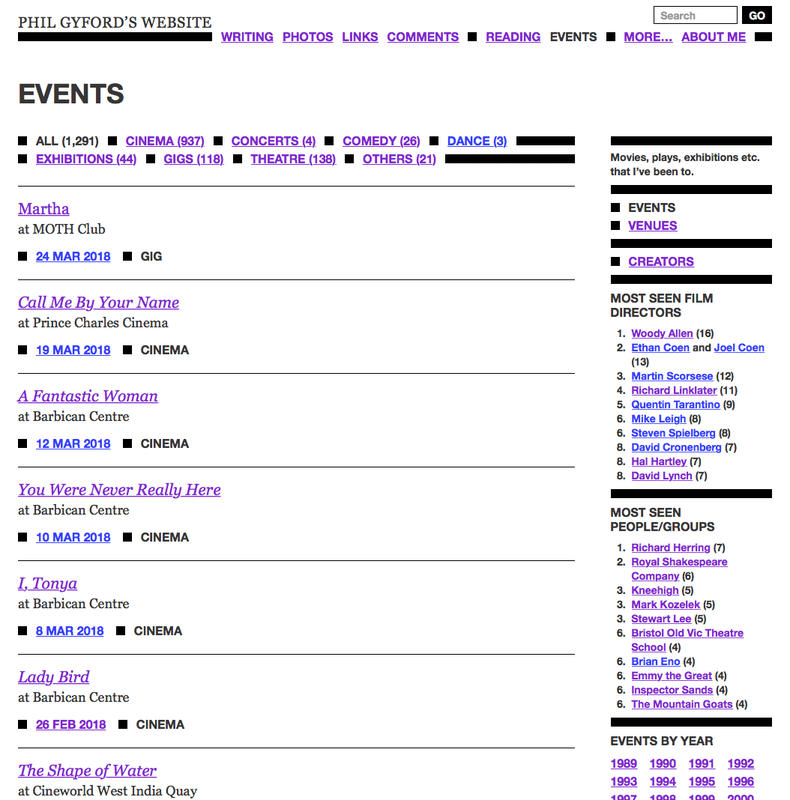 I recently completed my latest laborious personal project: My website now contains a catalogue of every movie, play, exhibition, gig, etc I’ve been to over the past 28 years. When I started my art foundation course in 1990, and on through university and beyond, I stuck tickets for events in my sketchbooks. These days my “sketchbooks” contain almost nothing but tickets (I’ll definitely start drawing again any day now oh yes for sure maybe next year). For some time this has felt like “data”, the kind of personal quantification that should, in my mind, exist online. So, during the years I was rewriting my website I always hoped to put this data online. Inevitably, even once I’d written the code to store and display this (django-spectator), the process took longer than expected. Some of this was realising the code wasn’t right and needed changing (more of which in my next post). But a lot of it was underestimating the time required to enter the data. There are currently 1,291 events, by which I mean visits to cinemas, or theatres, or exhibitions, etc. Which is a large number but it isn’t that many over 28 years. It’s less than one a week. Most of them are cinema trips. There are gaps. For example, there are some gigs I went to years ago that I don’t have tickets for and didn’t note down. And exhibitions are only recorded if I have a ticket, which generally means free exhibitions aren’t included. I’ll probably keep discovering events I haven’t yet recorded (even while writing this post I discovered four more in my calendar from years ago). 275 venues, each with a latitude and longitude, country, partial address and, for cinemas, a link to their page on the marvellous Cinema Treasures. 912 movies, each with director(s), year of release and a link to their page on IMDb. 138 plays, each with playwrights and, occasionally, directors. Adding the extra data (beyond the basics of title, date and venue name) added to the time this took. I casually thought “it’ll probably take a couple of days”. It took more like two weeks, which was both tedious and an enjoyable trip down memory lane to, er, memory venues. I became quite glad I don’t go out more. But this is enough for now. Entering the data could sometimes be fairly quick but occasionally I’d hit something that would take a while to figure out. The slowest part of the process was trying to identify venues, and their locations, from years ago, particularly in other countries. I’d end up on archived 1990s websites to try and find a particular cinema in Alabama, or “driving” around Paris on Google Street View to distinguish one ten-years-ago cinema from another. If it wasn’t for Cinema Treasures I’d never have untangled some of the cinemas, places that often change ownership and name every few years. Recording the changing venue names over time was a problem in itself (more of which in the next post). It was also difficult to track down details of older events given that the websites of most venues only, at best, keep past listings since their last website redesign. It’s such a shame that one of the criteria for such redesigns isn’t “keep all the existing data about our events”. So much information lost. At the very least, for theatres, work with something like Theatricalia to keep historical records. I knew the Barbican would be top but I had no idea where anything else would appear in this list. I was pleased that three Bristol cinemas made it in, with nearly all their trips between 1990 and 1995. When I went to Bristol was when I first started going to the cinema regularly and I have very fond memories, particularly of the little Arts Centre Cinema (now the Cube Cinema). I’ve had a feeling that I go to fewer things than I used to, so I thought it’d be interesting (again, maybe only to me) to see if that was true. Here’s a chart showing the number of events I’ve been to per year. I’m definitely going to fewer things than I once did. The larger number of theatre trips around 2006-2008 was when I was at LISPA and so tended to hear more about what was worth going to. If nothing else, seeing this chart might nudge me to see more things. This is counting the number of distinct movies I’ve seen per director. If I counted visits to the same movie multiple times I think Richard Linklater would be at 2, David Lynch would move up, Baz Luhrmann would be in this chart, and probably other changes. The terrible thing about this chart (aside from the dubious status of Woody Allen) is that they’re all white men. Even extending this list to the top 30 there’d only be one woman, Sofia Coppola. This is mainly, I hope, due to inequalities in the industry rather than me having an irrational and unacknowledged dislike of female directors. To some degree the chart indicates prolificness, as much as it does my own preferences. There are only two movies I’ve seen at the cinema more than twice: Blade Runner four times (twice more than I remember) and Wild at Heart three times. I haven’t seen a lot of comedians, so there’s not much of a chart. Richard Herring is at the top, two viewings ahead of Stewart Lee as I’ve seen Herring seven times rather than five. He must be so pleased. The only play I’ve seen more than twice is The Tempest (three times). Although I think I also saw a production while at school… so much missing data! I expected there to be events I couldn’t remember and there were. For example, there were films I couldn’t remember going to see. But there were also films that, if you’d asked me, I’d swear having no knowledge of even existing, never mind having paid money to see them at the cinema. Even some plays, which are (for me) rarer and often more distinctive, I have no memory of. On the other hand, for a surprising amount of events I could remember roughly where I was in the auditorium and other little details. Brains store a lot of stuff don’t they. It was nice to be reminded of some things from long ago… going out with friends, or going to interesting cinemas in foreign countries. Not that one needs to spend months writing code and typing in data to get a hit of nostalgia. Although the difficult, hard-to-pin-down events made the going slower, it was satisfying to do the digital archeology in working out dates or locations. Going through my calendar, my diary, Foursquare check-ins, photos on Flickr. Gig listings on Last.fm or Songkick or fan sites or reviews in old newspaper articles or long-neglected blogs. Some events that were ten years ago seem really recent, even while other things I was doing at the time, such as projects at work, seem like ages ago. Brains are weird. Structuring the code was, as ever, a balance between accurately representing reality and not getting too complicated. I simplified the code several times after I started entering data. There are some compromises that are fine and some that annoy me slightly. More on this kind of stuff in another post. Right now this doesn’t quite feel worth the amount of effort it’s taken. However it is really satisfying to have all this stuff online in a form I can search and browse. I love having it. And now it’s in place it’s very quick to keep adding new events. Maybe it’ll still be here, twice as extensive, maybe with more kinds of data, in another 28 years. In the next post I write about how I thought about writing the code for this, the decisions I made, and what I changed as I went along.